I recently picked up a few audiobooks from the library along with a book called, Retiring Well on a Poor Man’s Budget. While I’m not retiring any time soon – I thought it would be an interesting read. The book contains over 1,000 ways to stretch your income and “enjoy your golden years”. They list a few really neat websites that I’ve never heard of – but want to pass along to you. 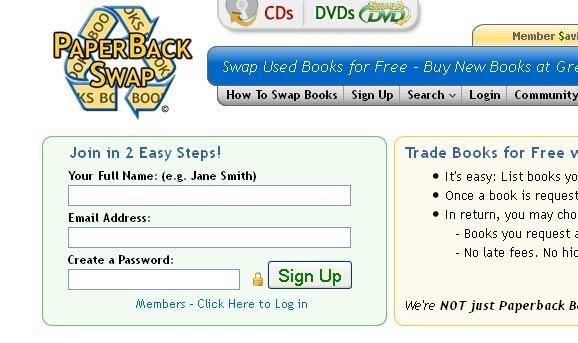 Owned by the same company – one site is called PaperBackSwap.com another SwapADVD.com and the last, SwapACD.com. These sites have been around awhile – and contain a lot of books/DVDs/CDs that are available for swap (PaperbackSwap.com alone has over 4 million books ready to be swapped!). And, it’s pretty straightforward and easy to sign-up. Sign-up to get free DVDs, books and CDs! Since these sites are brothers and sisters of each other, it is very easy to sign-up to one OR all of them in one sitting. To get started, all you need to do is enter your full name, email address and a password. After you’ve done that you will get an email to confirm your registration/membership. Be sure to click the link so you are good to go. The gist of these sites is this: You list books, DVDs or CDs that you no longer want and wish to share with others. When someone requests one of your items and you mail it to them (on your dime), you will be given a credit to get a book, DVD or CD of your choosing – for free! PaperbackSwap.com will give you 2 free credits when you sign-up and list 10 books that you no longer want lying around your house. SwapADVD.com will give you 1 credit for listing 10 DVDs. The catch? Yeah, always a little bit of a catch, right? You will need to pay for shipping on the items members request you ship to them. But, if you use one of your credits that you got for free, you can get that shipping back as that member then will return the favor and ship the requested book to you at no charge. PaperbackSwap.com provides you with ready-labels (and a “wrap”) when someone requests a book and also gives you the option of buying a stamp (needs to be 13oz. or less to print/ship on your own). I really like the idea of swapping as you can declutter with books, DVDs and CDs that have been lying around the house collecting dust and taking up space AND at the same time, you can put items that you are wanting by putting them on your wishlist or browsing what is available in the websites libraries. All of the sites have the option of using credits + cash to purchase the items new if you don’t want to wait around for something on your list that is not yet “swappable”. Most items seem to be slightly cheaper than buying at Amazon or at the store. Have you tried any of these sites out and what is your experience? While I have only just signed up at two of the sites and listed some items, I am going to come back in a month or so and update the post with my thoughts on using the service. Already I have two books that need to be shipped off and a DVD. I can see where this could get spendy if I’m only shipping out and not taking advantage of items that I want (or aren’t yet available). I think it’s a great idea overall, but I somehow have that feeling of the 12-for-1 CD club that I used to be part of. Remember those? I’ve used PB Swap for years and it works great. The library is still the best source of books obviously but if a new book comes out, I “wish list” it immediately and wait for one to become available. If I love it, I keep it. If not, I have the option to swap it and receive a credit to use on a future book. The site makes a little money by selling new titles it obtains from publishers, but usually at a significant discount from cover price. But it’s no Columbia Record House scam for certain. If you run short of credits, you can buy them from PBS too for about $3.50 per. When I run out of credits, I hit the Sunday garage sales and buy a sack full of books for a couple of bucks. That always nets me 3-10 credtit when I find a new home for them. Lastly, you will normally send the books you swap via Media Mail. But if you take them to the post office, occasionally you’ll find that Media Mail isn’t the cheapest. Just tell the clerk you’re shipping a book and they’ll look at all shipping options. Hope this helps! Thanks for your feedback on the site Ricci!